The Last Jedi landed like a meteor this past December. And it went on to become the most profitable movie of 2017, earning $1.3 billion at the worldwide box office. The Rian Johnson directed space opera offered staggering reveals that have divided an entire fanbase of devotees. Some absolutely love it. Even more seem to hate it. But a strange thing has happened for its home video debut. A new petition was launched. And suddenly some fans decided they needed to see General Leia's arc finished. Now, they are calling for Meryl Streep to come in and finish the role. If Carrie Fisher were to get recast, this seems like the pure fantasy choice. Meryl Streep is the greatest actress of the last forty years. She doesn't look anything like Carrie Fisher and is taller at 5'6". But think of the buzz her casting would generate. Streep has never done science fiction. Imagine if Lucasfilm offered her arguably the definitive female role in sci-fi. Streep could build on Leia and make her even more compelling. I can picture Streep as Leia, facing down Kylo Ren in a showdown for the ages. But will it really happen. Will Lucasfilm and Disney ever consider replacing Carrie Fisher as a real option. The status of General Leia Organa (Carrie Fisher) is in limbo. The Resistance leader and mother of Kylo Ren (Adam Driver) survives The Last Jedi. The film closes with her holding Rey (Daisy Ridley), as they escape from the First Order in the Millennium Falcon. So what comes next? Kill the character off when no one is looking? Or recast her? Carrie Fisher passed away on December 27, 2016; after completing filming on The Last Jedi. Fandom had assumed that General Leia's character would be written out to reflect Fisher's death. This may not be the case. General Leia was always supposed to be an integral player in the upcoming Star Wars 9. She not only continues to lead the Resistance, but looks to be a mentor to Rey, and drumroll please; sets up a pivotal reckoning with Kylo Ren. Ben Solo could not bring himself to kill his mother as he swooped in on her ship. Kylo Ren has not faced his mother in person. Leia will be told by Rey that Kylo Ren saved her and killed Snoke (Andy Serkis). Logic dictates that Episode IX should have a confrontation, or settlement, between mother and son. Lucasfilm CEO Kathleen Kennedy has clearly stated that Carrie Fisher will not be digitally recreated like Peter Cushing was for Rogue One. This means, if they do bring Leia back in another capacity, the character will have to be cut together using existing footage or recast with a different actress. It would be impossible to glean an entirely new performance from old footage. Maybe. Leia is never in the same scene or directly speaking to Kylo Ren. The only recourse to continue a vibrant storyline is cast a new actress to replace Carrie Fisher. This may sound like heresy, but I personally don't think Carrie Fisher would want Leia to die with her. There are fantastic actresses capable of picking up the mantle. 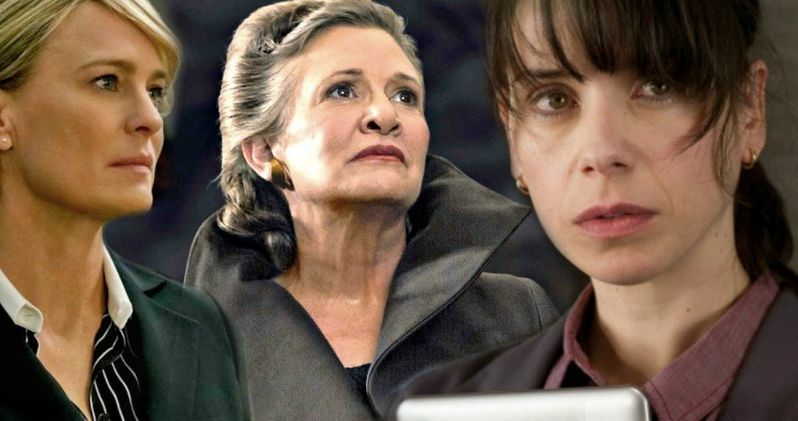 Here are my five best choices to be the new matriarch of the Star Wars saga. Keep Leia in the family and cast her half-sister, Joely Fisher. Joely is the daughter of Eddie Fisher and Connie Stevens. She is eleven years younger than Carrie Fisher, but the best physical approximation. Joely has had a relatively successful career as an actress with most of her work seen on series television. She grew up with her sister's Star Wars fame, so ostensibly should be prepared to carry the torch. Joely would no doubt be a sentimental choice for fans. Olivia Colman is a vaunted British actress that will replace Claire Foy as Queen Elizabeth II in Netflix's The Queen, season 3. Colman is extremely talented and versatile. She's been a staple of British television, film, and theatre for thirty years. I became a huge fan of her crime series, Broadchurch. Colman is taller than Carrie Fisher, 5'7" as opposed to a diminutive 5'1". But she has a similar face and the acting skill to deliver serious gravitas to General Leia. Sally Hawkins can currently be seen in Guillermo Del Toro's The Shape of Water. The British actress is a remarkable performer with award nominations galore for her past work. She vanishes completely into any role. I have no doubt that she could play Leia with a new perspective. Hawkins matches Carrie Fisher's small stature. She's 5'2" and looks close enough to Fisher. Hawkins is forty-one, so she is much younger, but nothing that make-up and hair cannot recreate. Robin Wright knows at least a little something about politics, as she is taking over the seat at the White House on House of Cards following the firing of Kevin Spacey. Maybe space politics are a little different, but not much. Dressed in Leia's regal attire, she almost slides perfectly into the role. Except she is 5′ 6″, which may be much to tall to properly play the much more diminutive Fisher. She has what it takes in the acting department to pull off Leia. More than anything, she has that regal presence that is much needed in the role. Laura Linney is the best actress to replace Carrie Fisher. She stands a towering 5'7" comparatively, but fits the Fisher mold on multiple levels. Her age, facial structure, and delivery cadence is perfect. I can picture Laura Linney with elaborate hair braids spouting Leia's lines. Linney can be serious and clever at the same time. She can be the stalwart rock that leads the Resistance, loving mentor to Rey, and badass Force user to confront Kylo Ren. Her height difference can be dealt with through forced perspective filming. Linney has all the intangibles, physical traits to continue Leia for Episode IX and beyond.